Bite is a new line of beauty products that focus solely on the mouth ("Bite"- get it?) and featuring the potent antioxidant resveratrol and a high amount of pigment. 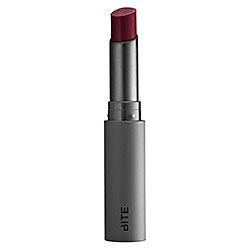 Bite SPF 15 Sheer Balm Claret is perfect for when you want a soft, yet defined, color, moisture and sheen, not shine. It's could almost be considered a "semi-lip gloss" The colors are all very pigmented and soft - my favorites were Claret (a soft red/wine shade with a touch of brown that works on all skin tones), Concord (a mauve/plum) and Carmine (a sheer red with a touch of orange). The texture is also unbelievably creamy, soft and moisturizing - yet never oily, heavy or greasy. This also gave me a nice moist sheen, which was suitable for day or night. The colors are also long wearing (only a few extra swipes were needed after drinking/eating) and it also contains SPF 15. *This product was provided courtesy of Bite PR for reviewing purposes.